After spending a long, cold night at 11k feet and not sleeping well despite my considerable exhaustion, my distaste for camping was growing. So when our wake up call came, I was ready to get at it. We were much more efficient packing up our belongings and throwing on yesterday’s clothes without too much disgust. The relative amount of filth on our bodies was heading from tolerably uncomfortable to sort of gross, but we weren’t stinky yet so that was something. While I was missing my showers and rapidly becoming tired of squat toilets, I was pleased with how I was holding up physically. My legs were not sore from the previous day’s climb, proof that my training had paid off. 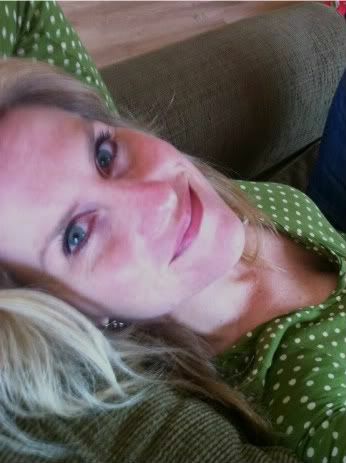 When we finally unzipped the door to our tent, I had my first inkling that the day might be really great. The sun was just starting to light up the horizon. This planet blows my mind. There’s a ruin there if you look for it. 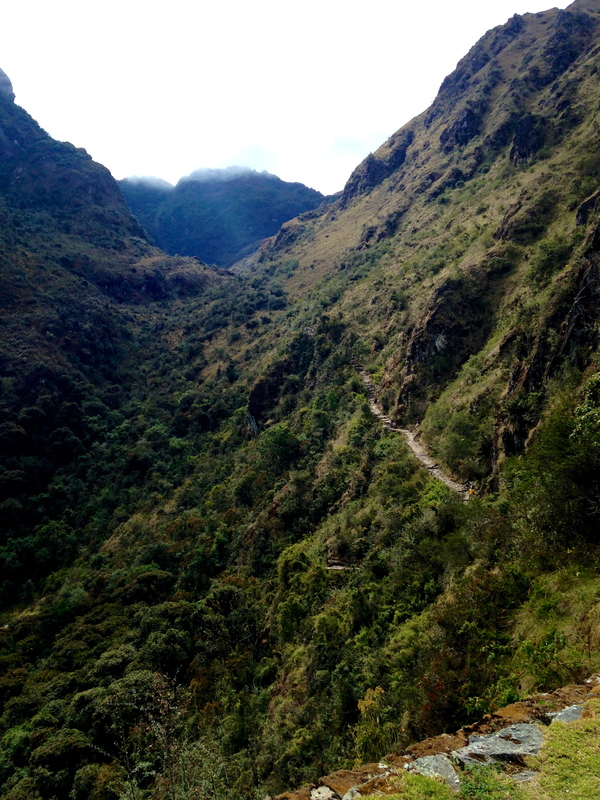 As we began our day, we headed into the cloud forest up the steep path I’d seen and mentally anticipated the day before. Because we were getting closer to Machu Picchu, we were seeing more evidence of the Incas as ruins dotted the hillsides. Honestly, the ruins you encounter along the way make the trek completely worth it. I mean, you’re in the middle of nowhere. There are no cars to get to these places. You walk in or you don’t get there. I kept thinking about that and about how incredibly fortunate I was to be able to do this hike. I hadn’t even reached the end game yet, but I knew without a doubt that this is the way to get to Machu Picchu if you can, having the whole experience in the Andes. Sure. You’re hiking with 200 of your newest best friends, so it’s not completely secluded. But it is impressive and well worth the effort and the pit toilets. Once we’d finished our ascent, we were solidly in the cloud forest. At one point, my hiking friends and I placed guesses about the altitude here. I guessed around 12k feet. We were closer to 13k. We hiked along a trail that wound along the sides of cliffs. If you slipped, the only thing stopping you from tumbling down was a dense carpet of foliage as far as the eye could see. The trail in this relatively flat section at top was an old cobblestone pathway. It seemed out-of-place and yet it was so cool that it was there. I appreciated that we were at least temporarily finished with the wretched stairs. We stopped and investigated plants and took lots of photos, none of which did any justice to the beauty of our surroundings. Ray had urged us to take our time and enjoy the ride. Everyone else was at least 15 minutes ahead of us, so it appeared we were the only ones in our group who were taking that recommendation seriously. It was a flawless day, sunny with the low-hanging clouds you would expect in a cloud forest. It seemed a shame to rush through the experience. Day Three was rapidly shaping up to be my favorite day of the trek. I didn’t want time to pass or the day to end but, dang it, I was hungry again. I needed lunch. I’d like to have my lunch served here everyday, please. 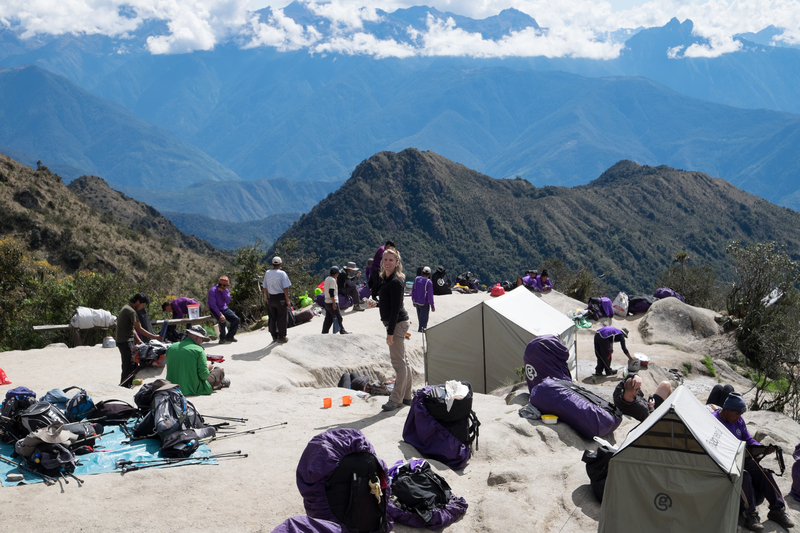 After a short scramble up some more infernal stairs, we found ourselves atop a rock outcropping in a sea of tents. The views were nearly 360 degrees. We were on top of the world. 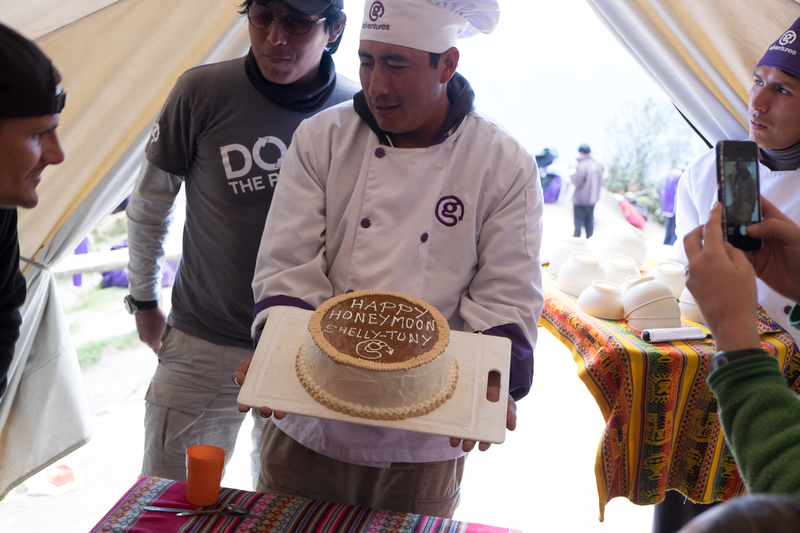 Our porters and chefs had set up another delicious meal, and this one ended with cake. Seriously. CAKE. On top of a mountain in the Andes. It was frosted and decorated in honor of a couple of newlyweds on our trip. 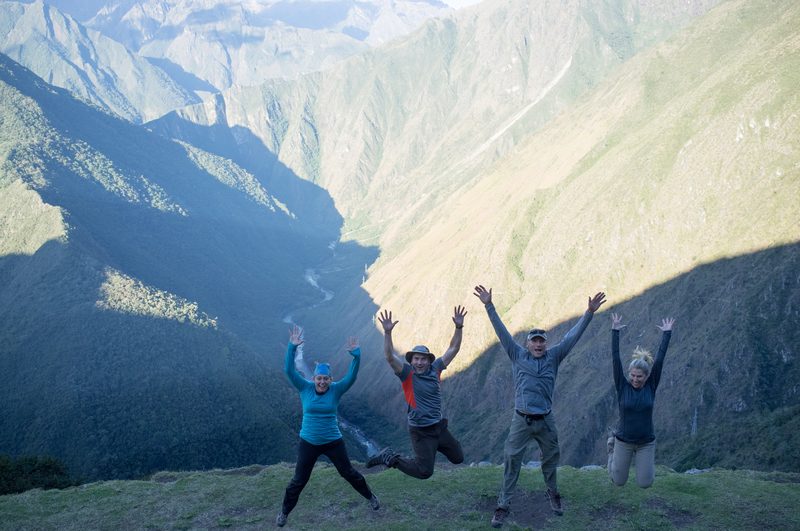 If you’re going to backpack in the Andes, do yourself a favor and spring for a good tour company with porters and chefs. Having someone else help with your heavy load and do the meal planning and cooking is the best gift a stay-at-home mom can ask for. Cake at high altitude. How did they do that? I can’t bake a successful cake from scratch at 5k feet. It must be chef school that makes the difference. That’s where they keep the secret. After lunch, we found a spot to sit for a while to let our food settle. I pulled out my iPhone, which I’d kept off for most of the trek knowing we wouldn’t have a signal. 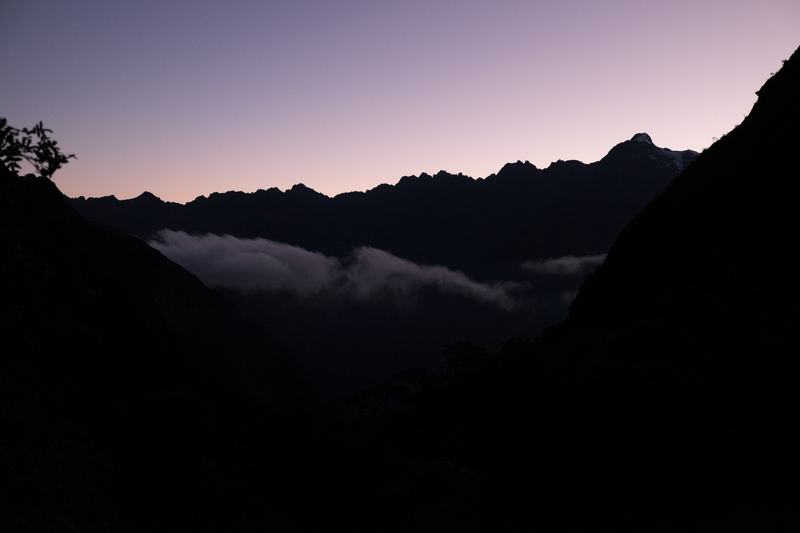 But we were now about a 5-6 hour walk from Machu Picchu and, well, hope springs eternal. I fired up my phone and discovered we had signal strong enough to make an actual call. We hadn’t spoken to our boys on the phone since we’d left. It seemed like this would be a perfect time to call. Once we convinced my sister-in-law that everything was fine and no one had died, we told her that we were calling her from a mountain top in the Andes and we had limited time. She put our oldest on the phone. His first question was, “How do you have coverage there?” Then, our safety-conscious son followed up by asking, “You’re not near any cliffs, are you?” It was almost like being at home. The rest of the day was even more magical than the first part. It seemed that every bend we rounded brought us a better surprise. 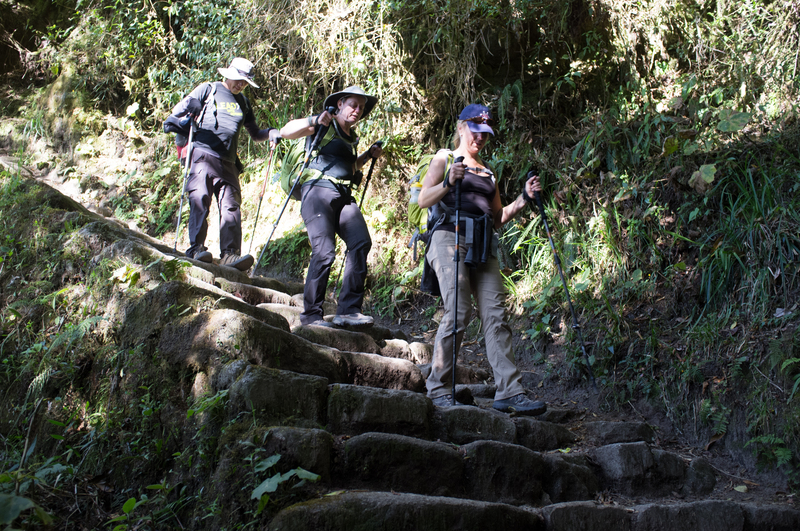 Who knew that the Inca Trail had tunnels and spiral staircases? We sure didn’t until we found them. Those Inca were clever craftsman. We were descending rapidly into a lush forest. Because it was the dry season, we weren’t seeing a ton of the orchids the cloud forest is known for but the vines, moss, and ferns made it not matter a lot. It was a scene out of Raiders of the Lost Ark. I was half waiting for natives with poison darts to come running at us. Steve was just hoping there would be no snakes. When our tour group had coalesced again, Ray told us that if we were willing to add an additional half hour of hiking into our already long day we could see one more ruin. I don’t think there was a person in our group who thought that would be a bad idea. 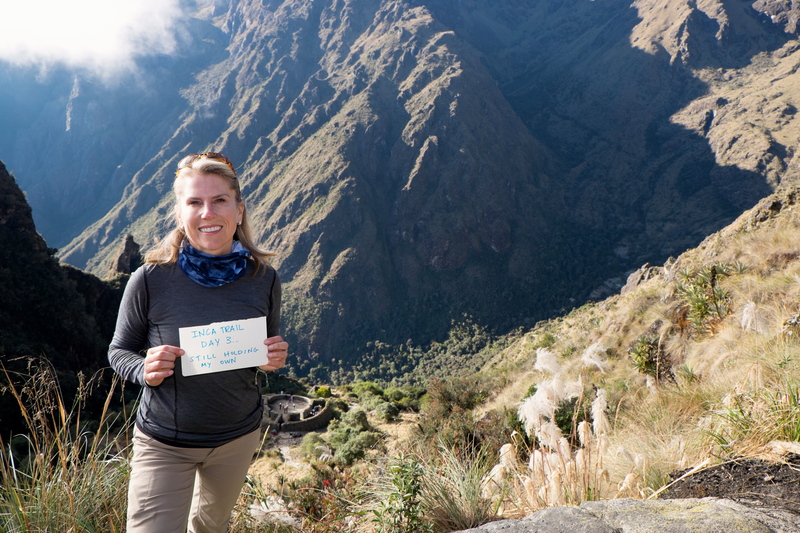 How many times are you in the Andes looking for ruins, anyway? So we took our little detour. The forest became more dense. We were having to duck our heads under tree limbs. The path leveled off and the drop off on my right side became more obvious. Where the heck was Ray taking us? I separated myself a bit from the others and took a moment to stand alone in the forest and soak it all in. I could have been the only person on earth. 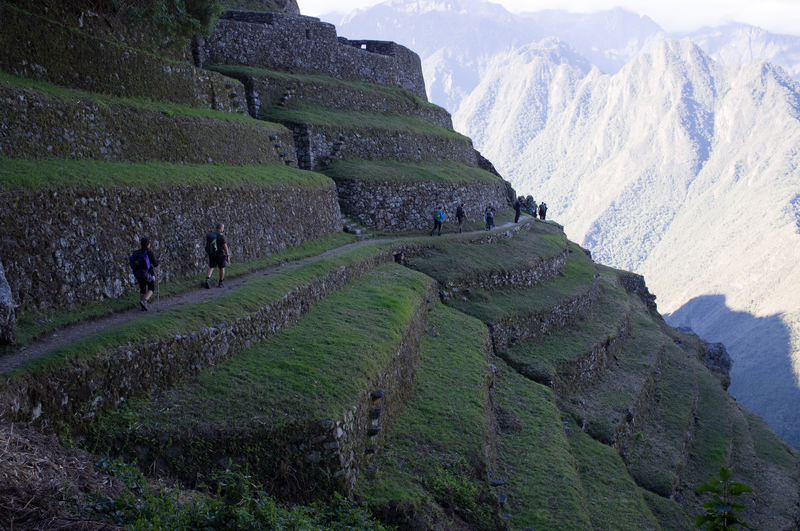 We emerged at the edge of the Intipata ruin. It seemed to appear from nowhere. I shook my head. Ray was right. This was well worth the extra steps. The agricultural terraces here were high above the Urubamba River below. We commented that if you fell backwards onto one and started rolling, you’d just keep rolling until you landed in the water a couple thousand feet below. That was not much of an exaggeration. We watched our footing. I was so grateful that Ray suggested this detour. It was definitely one of the highlights of the trip. You could tell by the quality of the ruins that we were nearer to the grand prize. We took a little time to walk around and enjoy the scenery. Ray gave us one last talk about the area and the history, finishing a story he’d started about the Incas on Day One. Don’t get out the walkers just yet! The sun was beginning to set rapidly and we had to backtrack a bit to get to our camp for the night. Before we headed in that direction, though, Ray talked us into a photo-op. It seemed a bit silly as we watched each couple pose for their photo. But when it was our turn, we did a trial run and then went for it. Turns out old folks can jump! Yep. We’ve still got it…even if sometimes we walk into a room to look for it and forget we went in there for it. That’s a good blog, Mom.